FOR THOSE OF YOU THAT PLEDGED, YOU MAY HONOR YOUR PLEDGE VIA PAYPAL TO: sarboxers@yahoo.com PLEASE MAKE SURE TO SELECT (sending money to family or friends) SO NO FEES WILL BE TAKEN OUT.. ALSO MAKE SURE TO NOTE FOR "Stacy" THANK YOU SO MUCH FOR HELPING SAVE A LIFE!!! 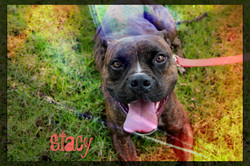 Stacy is super sweet and loves people and her human11 month old foster brother. She is a 15 month old brindle boxer mix already had a litter of puppies .